Will Elder Scrolls V Skyrim run decent on your Mac? If your Mac is relatively new (2009 models and up) the answer is probably, but before you go jumping into Bootcamp, installing Windows on another partition, and buying the game, let’s check to be certain that it will run on your hardware, and run at an acceptable rate for that matter. Both cases you’ll need a DirectX compatible sound card but all Macs have those so that isn’t an issue. The first thing to notice is that in terms of RAM and CPU, nearly all modern Macs meet or exceed those specs, so what you really want to focus on is the graphics card chipset and video RAM (VRAM). What we’re going to do is retrieve the graphics card info from your Mac and then search a giant list of compatible GPU’s to see if and where it appears on a giant list below, this will let you know if your Mac can handle running Skyrim. Find a result? Congrats, you can probably run Skyrim, scroll up to see where the assumed graphics settings will be. If you’re barely on the edge, you may want to reconsider. If you’re in doubt, don’t risk wasting the money and just play the console version that is guaranteed to work well. Don’t see a match? Try searching for a variation of the chipset (320M vs GeForce 320) to see if that’s how it’s listed instead. Remember, this list is intended for PC users and not Mac users, and sometimes the GPU is listed or named slightly different. Still don’t see a match? It probably won’t run, this includes most of the Intel chipsets, sorry! Go for the Xbox or PS3 versions instead. EXTREME: These cards SHOULD max the game at full 1080p, without any problems. HIGH: These cards should run Skyrim at high setings, give or take a little depending on the resolution. They will definitely play Skyrim well. MEDIUM/HIGH: These cards should be around medium/high settings give or take a little depending on the exact resolution. Some of these cards are showing their age but should still be more then sufficient for Skyrim. MEDIUM: These cards should be around solid medium settings give or take a little depending on the resolution. These cards should be on par with the console version graphically or even a bit higher. MEDIUM/LOW: These cards should run Skyrim, with the right tweaks you could probably get them to look as good as the console version. The farther you get down the list the closer you are to low end. LOW END: These cards will have trouble running the game if they even run it. The game probably won’t be very enjoyable on any of these. The cards on the top of this of this list may be sufficient, but its more of a judgement call. The cards on the bottom probably won’t run Skyrim at all. If and how well a Mac can run Skryim is a question that myself and many others have had over the last few days. After answering this question for a few friends and again on Twitter, and then not finding any particularly easy answer online, I decided to write this up with the information I did find. Yes, it’s a Windows only game, but too many of us Mac users want to play Skyrim and it’s just not available for Mac OS X yet, so Bootcamp it is. If you can’t run this in on your Mac, there’s always Xbox 360 and PS3 too. If you’re looking for some more specific performance information and FPS tests, check out Toms hardware, although they are not Mac specific tests or GPU’s. Hi there. I meet the requirements on everything but the VRAM. I have a 2.4 Dual Core i5…8 GB of RAM…plenty of hard drive space…but only 256 MB of VRAM (NVIDIA GT 330m). What are the chances I’ll still be able to run this game? I have a macbook pro (fall of 2009 I believe) That I want to play skyrim on, it has a 9400m with 256 vram. Is skyrim playable on my computer? I have same laptop. how well does it run? was thinking about installing windows via bootcamp but really also don’t want to install windows on my mac either. but skyrim is hella run, i play it on my desktop but i do wish i had it while on the road. Hey grant, did you ever get the game to play on boot camp? I have a macbook pro 13in late 2010 2.4ghz nvidia geforce 320m vram256 can I run it? Did it work? I didn’t see this clearly marked above even though it was in the example above. I have the same requirements. same here i have that in my macbook and have been looking high and low to find out if it will work but with no luck if someone finds out please let me know! thanks. I do have a Macbook Pro 2011, with core i7, 8GB RAM and SSD. But, my graphic card is just a Intel HD 3000, with 512 MB. Is it enought? did you have to download any drivers? We’ve been waiting to see reports on how the HD 3000 handles the game, we’ll keep you posted if we hear anything. You checked while it was running on battery power right? The onboard Intel HD 3000 takes over whenever the macbook is unplugged. You can stop it from doing so by going into settings>energy saver and unchecking the ‘automatic graphicks switching’ option. I’ve got an old MBP from 2006 – the first gen.
Everything but the card seems to be o.k. – but there is no demo I can download to test, so: Will it run? I was able to install the latest AMD-drivers via a Mod (Apple wont deliver so I did it myself –> http://www.hardwareheaven.com/modtool.php ) and most games are running with them. I have CIV V running on my machine (slow but running) and the question is, if Skyrim would run. If you’re posting a comment about if your video card can run the game you obviously didn’t read any of the bloody article which answers your questions!! dolts! So I have a 24 widescreen mac probably 1 year old. I can run it on windows 7. I’ve got an Intel Core Duo CPU @ 2.93GHz with 4Go of RAM. Graphic card is a GeForce GT120. Will it run skyrim even on low? It works on medium (1280×800 resoultion) fine and it looks really really good. Soooo…MB pro 13′. Version 10.6.8. Bootcamp Windows XP Processor speed 2.53 GHz Core 2 Duo. 4 GB memory. Chipset model NVIDIA GeForce 9400M VRAM 256 MB. Will this work? Is this what you have? I have a 13″ MB Pro Mid 2009 running Windows 7 in Bootcamp. I have tried 5 times to no avail because of the failing of the initialization of the render… Kinda pisses me off. On the Mac partition it says I have 256mb of video ram but on Windows it says “n/a”. You know, there is that thing, they call it a driver. i’ve got the exact specs you posted but i get a message that says “failed to initialize renderer”, just wondering if you had any information about this issue? Hey, so, I have this same exact MBP, and I’m wondering if you’re still running the game and if it’s given you any issues. They don’t list the 9400M GeForce on the list so I have no idea where I stand. I have an iMac and meet all the requirements except the vram. My graphics card is an ATI Raedon 4670 HD 256 MB. Do you think I would be able to run this game at an enjoyable level? Yeah, i have an imac with an ATI HD 4670 (with 256mb) and it is playing fine. Much ado about nothing, all that 512mb stuff. Mine doesn’t seem to be on the list at all: Radeon HD2600 (not M, or Pro or XT) so I guess that means I’m out of luck. But thanks for running this article, I doubt I would have found this info on my own! Anyone playing this on a 13″ macbook pro 2010? If so, how does it run for you? Thanks. I am–bootcamp with windows 7 32 bit, totally playable on medium settings. Framerate drops a bit during intense action, but it doesn’t make it unplayable. what graphics card is this on your mac? all 13″ macbook pros in 2010 come with nvidia geforce 320M graphics cards. My GPU is supposedly supported and I meet all the necessary requirements. The only thing is that I have a 512mb ATI Radeon HD 6750M vs the 1gb version. Can I run sky rim on medium to high settings? Uhh, i am set with the mac specs to run on low…. running on High with no lag…. I recommend bumping the Geforce 330M up a category or two. I’ve got a mid-2011 27-inch iMac, with an ATI Radeon HD 6970M 2GB video card, 16GB RAM, with a 3.4GHz i7 Sandy Bridge processor. I’m running Windows 7 32-bit through Boot Camp. I’ve downloaded the latest 11.11 drivers that were released this week, and my game defaults to Medium. Whenever I bump it up to High or Ultra, the game starts lagging, and according to what I read, I sholuld be able to run it on Ultra. I’ve read around that Sandy Bridge iMacs have been having some video issues, and I’ve had some that were fixed by Catalyst, but I’m reading everywhere that my computer should run Skyrim just fine, and I can run it on Medium with some slight suttering, but on High or Ultra the stuttering gets ridiculous. This is on 1080×1920, whenever I try any of the settings on 2560×1440, it gets even worse. Any ideas on how to tackle this issue?? I’m perfectly fine enjoying the game on Medium, but knowing that I can run it flawlessly on Ultra, and not being able to, is messing with my brain! Do you have any tweaks to help? My Macbook Pro meets everything except graphics. My card is an Intel HD Graphics 3000 with 384mb of vram. Will I be able to run the game? The GPU is one of the most important components, but if you run the game on lower settings you may be able to play it on the Intel HD 3000. I have an early 2011 13″ mbp, I can run skyrim at decent settings. My settings: high textures (but not the HD texture DLC), low shadows, low radial blur, medium decals, everything else on that screen off. 800×600, most things fade at “5” (whatever that means), no grass (grass fade = 0), detail fade on. I also got the FXAA Post Process Injector mod, preset 2, but turned on the anti-aliasing with that mod. I get around 45 FPS on average, and it looks great. Just thought I’d let you know that I got it working on the 13″ mb pro 2010. 2.66, 4gb ram, 320m gfx card. high textures, low shadows, rest medium, all water effects on. around 30fps. perfectly playable so don’t hesitate to get this game. I have a 2.4 Intel core 2 duo and a ATI Radeon HD 2600 Pro will I be able to run it? I’ve been running Skyrim on my 09 MacBookPro and It periodically freezes to load.? It certainly doesn’t make the game unplayable but it certainly halts the experience. I am running XP SP3. I have a dual core 2.80ghz, 4 gig of RAM, and a NVIDIA GeForce 9600M GT. I got all the drivers from bootcamp, and as near as I can tell, they are all up to date. I cannot tell if windows recognizes my integrated and discrete GPUs and for some reason under the General tab in System Properties it reads 2.72 GB of RAM. I do not know if any of that effects anything. Switching to Low Detail setting in Skyrim doesn’t change anything and I it can’t really handle Ultra settings. I have modded it to use 4 GB of RAM and a few other mods that make it look as good as Ultra IMO. I have tried a few mods that should increase performance by downsizing texture resolutions and such; they haven’t changed anything. Is there anything I can do to tweak my video card? Am I better off just upgrading to W7 because they have better driver support? Should I upgrade to 8 GB of RAM if I’m going to W7? Is there any mods to help? Thanks so much for making this article! I’ve been looking all over for something to help me out on this before I possibly waste 60$ for a game I wouldn’t be able to play without a brand new computer. I’ve got a 2009 macbook pro. It has the 9400M and also, after that, it has a 9600M GT. I’ve got a copy of Vista lying around and I assume that if I get it up and running it will recognize the fact that I apparently have both of these cards. One has 256 MB and the other has 512 and I have 6GB of RAM. I’m hoping for at least medium settings. Fingers crossed. Mid-2011 27″ iMac with 2.7 GHz Core i5, 8 GB RAM, Radeon HD 6770M with 512 MB. Skyrim runs fine 1080p at medium settings. It will run on high settings, but the fps really drops and I get some stuttering. The game is perfectly playable (and quite beautiful) on medium. So I have the MacPro 2011 with the Intel HD 3000 graphics chipset. Apparently it is comparable with the GeForce 320M (http://t-gaap.com/2011/3/9/macbook-graphics-face-off-intel-hd-graphics-3000-vs-nvidia-geforce-320m). I’m a 4RAM but will probably add more. Do you think it would run at least on low settings with the added RAM and the graphics chip I have? i have sony vaio i5 with second gen cpu and nvidia geforce 410M 1GB i cant play skyrim even on the lowest settings I’ve tried everything but nothing worked I have 4gb ddr3 ram win764bit all of my driver up to date… any help will be preciated! This is a great article. loving osXdaily! I was playing the Windows version of the game (in low settings) with iMac late 2009 (core duo 2.4, 4GB ram, ATI4670 256MB) using parallels!! … yes, using parallels, and runs fine in low, sooo… i think that the mac-port for this game should run in any iMac configuration with, at least, the hardware I listed. When I try to play it, it lags. Playing on windows 7 x64 ultimate via bootcamp on my early 2011 mbp, i5 2.3, 8 GB ram, intel hd 3000 512 mb vram. On medium settings everything runs great and smooth. I meet all the specs, but not my vram, do you think on my ATI Radeon HD 2600 Pro, i can be able to run it ? Will Skyrim work on my Apple MacBook Pro? I’ve seen videos of people playing with this. You should be fine. That’s my exact set up. I can run pretty much perfectly on medium, although the game set it to high default (based on the graphics card). I tried it at high, but it was way to laggy for me. Does anyone know the best graphic settings for this graphics card? Other people with same specs as me can run it on medium but I can’t run it and I don’t know why! is there any chance of running this with 1gb of ram? or do i need to go buy a ram chip? i meet all the other requirements please help me if you can. Probably not. How old is your computer? Anyways Skyrim plays ok on medium settings without AA and AF (strange since it recommends high on my mbp). any chance It would play good for me or worth it to play it via bootcamp? can you just up Upgrade your video card and ram to the Recommended Spec???? Hello I have a 2011 Macbook pro 13 inch with intel HD 3000 graphics card, 4GB of RAM and an almost empty hardrive. My question is, will I be able to run skyrim with this graphics card? Graphics-	NVIDIA GeForce 9400M // VRAM- 256 MB…These are my specs for my Macbook (late 2008 early2009) and I was wondering if Skyrim would run well. I have played games like Starcraft 2 and Total War on my mac and they work well. Also, will windows vista be good enough for the game? Hello, i have a NVIDIA GeForce 9400 and i have 256MB. When i start Skyrim it takes like 10minutes to load, and when he’s done i got much lag, so i cant play it fine. What can i do? Oh, and i play skyrim on 1280 x 1024. Hi, I am running Skyrim on a IMac late 2007 – 2.16 Ghz/ 4GB Ram and Radeon 2600 Pro 256MB – Bootcamp, XP SP3 – installed from Stream. It works quite well with lower settings, but some of the graphics are missing, e.g. no visible fire, if i cast a fire spell. Has anyone encountered similar issues on a similar system and fixed them ? I can confirm that this game runs relatively well on a Mobility Radeon x1600. All the eye candy is turned off and a little overclocking and tweaking is necessary, but it does run and it is playable (around 25 fps outside). So I’m sure it will run on most halfway new Mac graphics chipsets (2008+). I hit Command+F in my browser window, but it only opens up a search bar. Will this effect my chances of being able to play? How do I get a numerical value? I have a Macbook pro from 2009. If I buy windows 7 and run the game in bootcamp, will I be able to play Skyrim? I’m hoping to be able to play at like 30fps at medium graphics, but that’s doubtful. I have over 200 GB of free hard drive space. Also, how many GB should I partition to windows in bootcamp if I want to run this game? i looked at my specs, and everything was better then required apart from the graphics card, i got the AMD radeon 6750m. Do you reckon that all the other almsot perfect specs will support my graphics card that was under the category of medium/high. please reply, i would rather buy skyrim without lagg then to find out i cant play it properly. i can run skyrim on my macbook not sure which model but do any of you know how to mod it? Thanks for this man, Skyrim looks good for my Mac. Already have it on xbox and I wanted it on the computer for all the awesome mods. Did this list take you a while to compile? Will Skyrim work on my Mac? I’m probably going to get the new MacBook with Retina Display, 2.3GHz quad-core Intel Core i7 processor (Turbo Boost up to 3.3GHz) with 6MB shared L3 cache, Intel HD Graphics 4000, NVIDIA GeForce GT 650M with 1GB of GDDR5 memory and automatic graphics switching. Will it run? I’ll probably put it through Boot Camp. Do you really have to ask that? Of course the latest and greatest macbook can run it, as a matter of fact it will probably be playable on max settings. Has anyone actually confirmed this? At the moment I am having problems running it through Bootcamp. I just bought a retina display and installed Windows 7 Home 64Bit. I installed Skyrim this morning and it appears to install fine, it detects the optimum setttings as high, and then it appears to launch. However, once the load screen appears I start having problems. Instead of a normal graphic (like picture of a race/dragon etc) I get a red screen and when I hit load/continue whatever the game crashes. I am still just starting to troubleshoot this problem but I would love to know if anyone else had a similar problem. FYI I am running skyrim with the HD pack and the Dawnguard DLC. Ever find your problem? I’m running a retina display and considering getting Skyrim now. Is it worth it? It won’t work any suggestions? One vote of warning here. I have an 2011 iMac, i7, Radeon 6970M 2GDDR5. Installed Windows 7 with Bootcamp, applied all of Microsoft’s updates (roughly 100), and downloaded Steam and Skyrim, and started playing. A minute or so into playing the game, the display goes haywire. Most of the time, it goes “blank” – just solid grey with thin vertical lines. The only way to get control of the Mac is to perform a hard reboot. Apple Hardware Test reports no issues with any of the hardware components, so I’m guessing it’s some sort of issue with the graphics drivers (an issue between DirectX and the AMD drivers?). I should note — I set this up in July, and was playing for a month before the problems started cropping up. I’ve tried rebuilding the Bootcamp partition, but the problem persists. It may be that one of Microsoft’s updates has fouled the graphics subsystem, but that’s would be a bear to diagnose. Hi i’ve got a Mac OSx version 10.6.8 and 3.2 GHz Intel core i3 4GB RAM 1333 Mhz DDR3 And from what i can see macbook pro is the only thing people use to play skyrim is my bootcamp windows 7 mac able to run skyrim on steam or pc disc at a pleasurable gamerate? Plz reply!!!!!!!!! 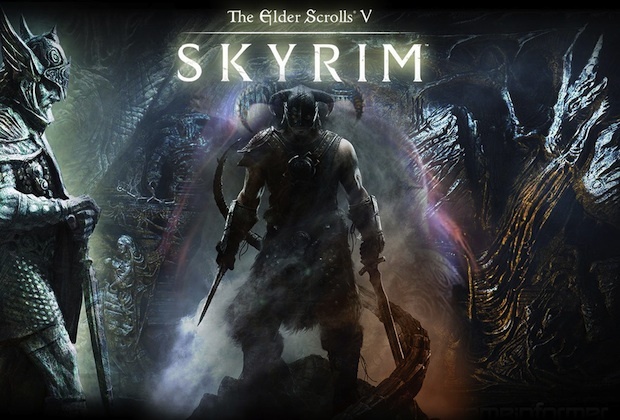 I installed Skyrim on my Macbook Pro 13″ Mid 2012 BOOTCAMP (Windows 7 Prof) and it installed properly. But a box that says “Failed to Initialize Render…Blahblah” pops up and it won’t start. Am i missing something or is my MBP failing me again? Running Skyrim legally with Steam on my Late 2012 with 30+ mods at a smooth fps, currently using the latest wineskin wrapper.